RECAP PART I: Six weeks of decline, tears, fear, and hell, there was no hope. I decided to quit. 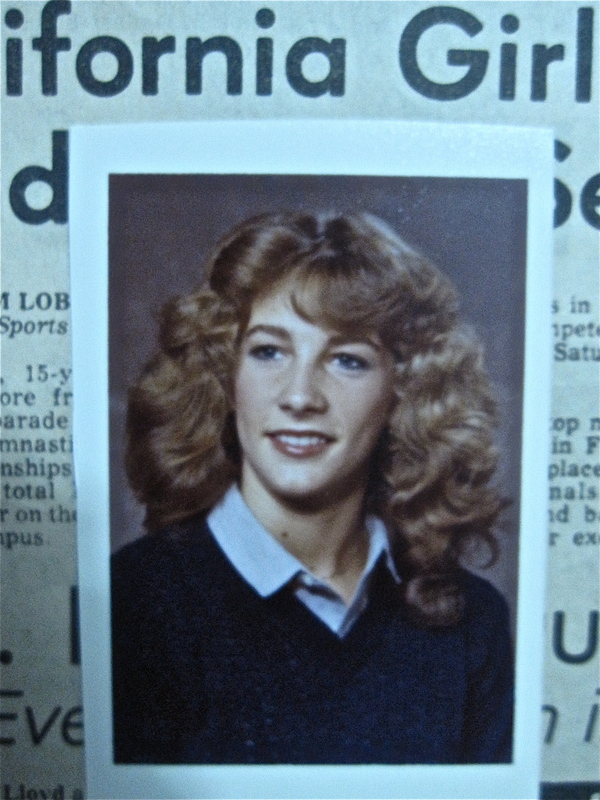 My mom introduced reality: If I quit, my life would change – I wouldn’t train, travel, or compete – I will be NORMAL like other HS kids. I became terrified: If I’m not a gymnast, Who am I? …I love gymnastics. I am a gymnast. I cannot quit. I must try. SPORT PSYCHOLOGY? So we met. Ken and Lynn offered to work with me twice a week, 2 hours a day – teach me methods in sport psychology. It seemed strange to talk about fear, do breathing and meditation. But hey, nothing else worked. I was willing to try. LEARN MENTAL SKILLS: The first hour was always in Ken’s office. We talked. He asked me questions, what I was thinking and feeling when I attempted my tricks in the gym. At what point do you start to feel afraid? Hm, this was not easy. I tried to imagine doing my skills, but often, I couldn’t or just got scared. So we started at the beginning, with very basic moves. I wrote and wrote in a journal. I captured details and emotions. He taught me Mental Tools: How to STOP, BREATHE, and USE A TRAFFIC SIGNAL as a model to manage my fear – green was go (no fear), yellow was pause (little fear), red was stop (peeing my pants from fear). I learned and practiced deep breathing, relaxation, clearing the mind, concentration, positive self-talk. Then I’d focus on one image or a word (that cued me). I visualized the simplest moves, then, harder moves (mental imagery). I did everything in my mind in slow motion, s-l-o-w–m-o-t-i-o-n. After a few weeks, I started to gain mental confidence. My fear temporarily disappeared at times, when things seemed easy and in control. But I was nervous. Ken put me AT EASE. His voice, gentle, his energy, very patient. I trusted him. APPLY MENTAL SKILLS IN THE GYM: The second hour I spent in the gym. Lynn was my spotter, Ken guided me, starting with most basic skills. Front roll. Back roll. Like a 2 yr-old. Lynn supported me with his hands on my neck and back for safety and comfort. I did everything in slow motion, staying present in each moment, like slicing the skill into fractions. A single somersault had 10 slices – I became aware of the position of my chin, my toes, my knees, in every slice. I was acutely aware of every body part in every moment. I gradually advanced to handstands, walkovers, and more. At times, I’d get scared, but Ken and Lynn were patient, encouraged me to apply the tools, breathe, relax, and stay present. They put me in a spotting belt attached to cables and pulleys. I was held safe, so I relaxed a little more. Gradually, my confidence grew. I moved to handsprings and single flips. Each week, more and more, I became a master in the art of self-awareness – to notice anxious thoughts, breathe, release them, be present, and re-assert myself. Allow the natural flow of movement to come. I had to TRUST it would come. AFTER 3 MONTHS: I re-learned my skills, except the double back. I got in shape for competition, but I was not completely healed. Anxiety crept up on me, often. But now, it was January and time to compete. Would I be able to do my skills — under pressure? Could I qualify for Elite? Kips A Team 1979 (L-R): Dena, Donna, Sharon, Karen, annnd me, during competition. I looked up to my teammates. They motivated me. WORST SETBACK EVER – Part 1 How I lost my skills, nearly quit, re-learned everything, and by a MIRACLE won 2 National Titles. 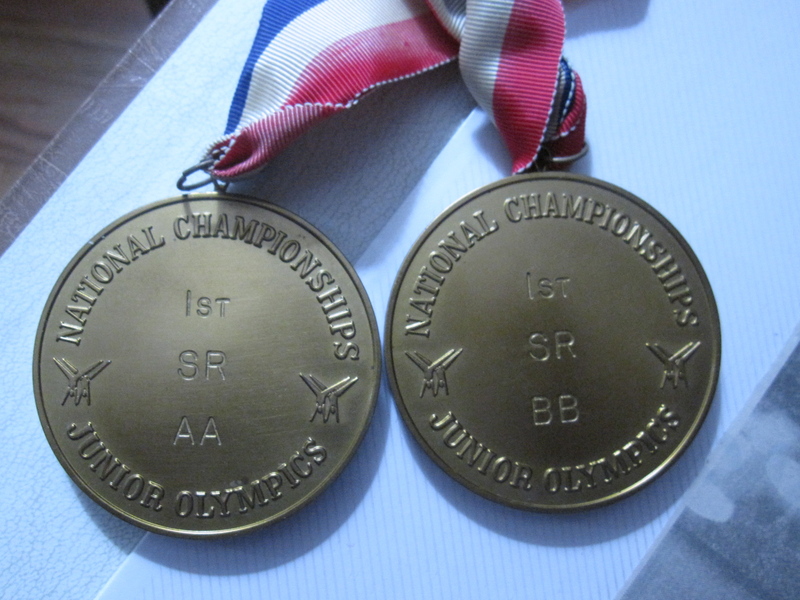 I placed 15th in the country at Junior Olympic Nationals (age 14). Then I began training for the next level, Elite, the Olympic level. I always dreamed of competing in the Olympics. I’m tall for a gymnast, but it didn’t matter. I thought I had a shot to make the U.S. National Team. 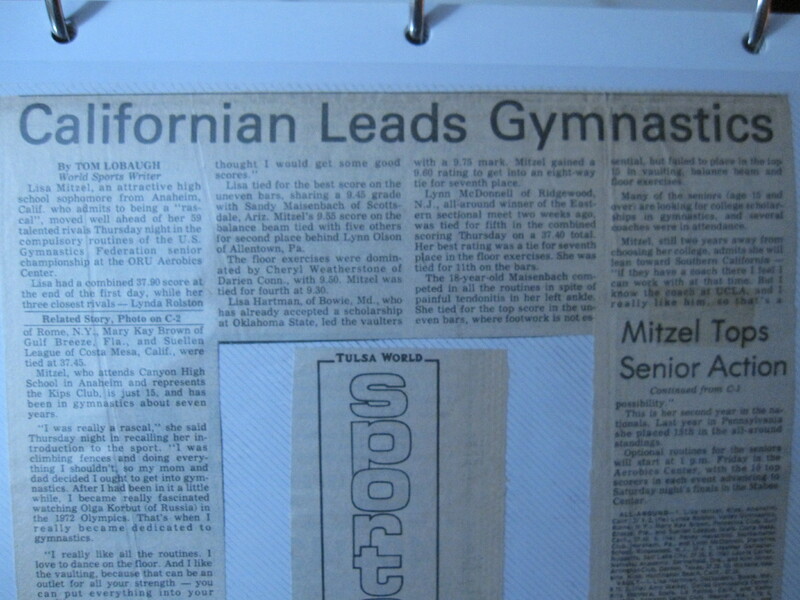 Maybe I could make Olympic Trials, then get a chance to make the 1980 Olympic Team! Six months of hard training, learning new tricks, I could qualify for Elite. Maybe it would happen. A few months later, I was 15. It was August. I had a crash in the gym. BAD CRASH. A new tumbling pass across the floor, round-off-backhandspring-JUMP-UP for a double back (2 flips backwards). I was in the air, tuck position, flipping, but suddenly I got lost (Where am I? The first flip? The second flip?). So I opened up–too early. CRASH! I hit the ground, WHACK!!!!! my knee hit my forehead. But it was more like – CRASH! WHACK!!!!! I was out. 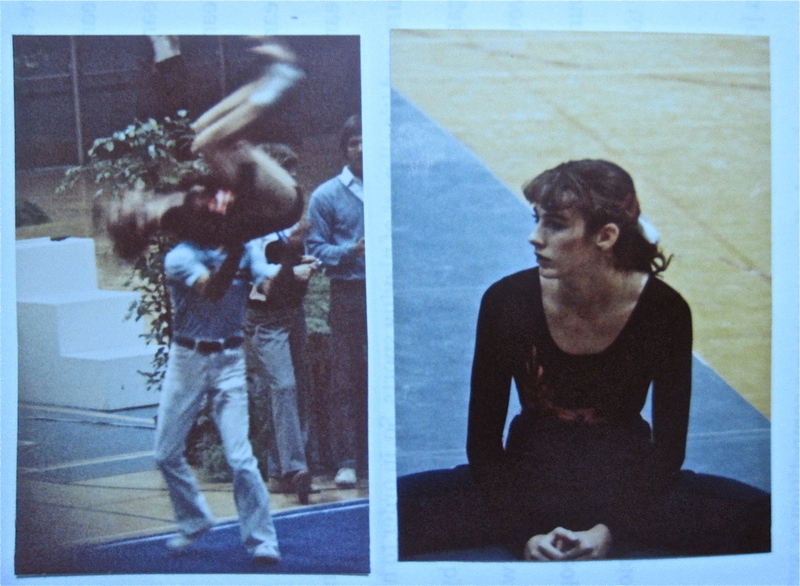 L: Me, flipping in the middle of a double-back, Coach Tom Masuda spotting. This was unsettling. I never took three days off. THREE DAYS was F-O-R-E-V-E-R-R-R-R-R. 😦 I played and re-played, over and over, for three long days what happened. I jumped in the air, started to flip–? I tried to break it down, figure out where, what, how, but my mind was blank. I felt confused at why I didn’t complete the double back. There was no answer. I guess I jumped up, lost control, and got amnesia. When I returned to the gym – nerves fluttered through my mind and body. I told myself: You’re fine. You’re fine. Just practice like always. But I wasn’t fine. I wasn’t fine every day for the next six weeks. I was afraid of the double back. And I developed a fear for any type of backward movement, on every event. The fear became a contagious disease. I started to run, then stopped. My coach yelled. I tried again. I did a round-off, and freaked out. I got super scared. I couldn’t remember how to do my tricks. I cried in the car and at home. I prayed, but nothing. For six weeks, I regressed and fell apart. I lost 70% of my skills. No one could help me. All I could do was dance and basic practice drills. 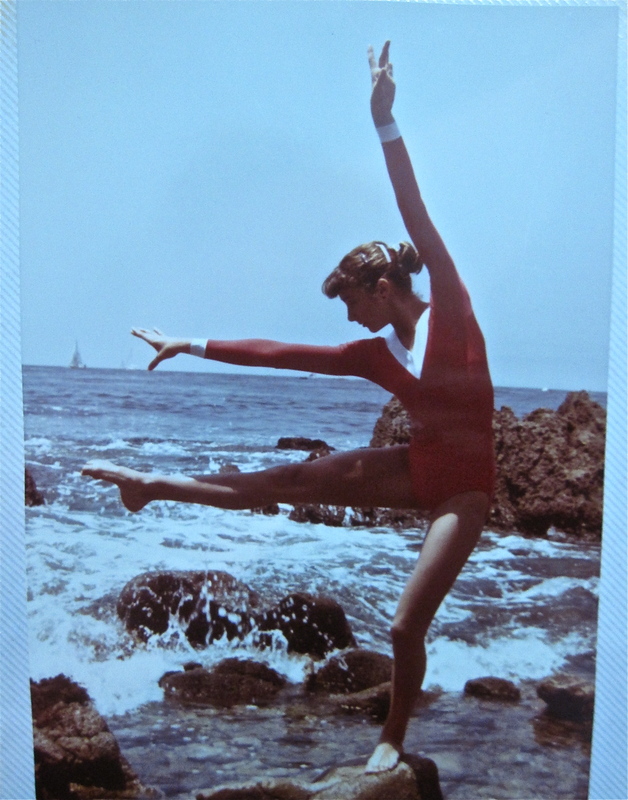 Finally, I was so far from the gymnast I’d been, I couldn’t take it anymore. I told my mom, “I’m going to quit.” It was hard to say it, but in the gym, I had nothing to look forward to. The coaches were extremely frustrated, I was depressed, and the struggle was just too much. [Message #1 – Do NOT give up, Do NOT quit. Here’s why.] While my gymnastics career was dying, I had a horrifying realization that something else was much, MUCH worse. My mom came into my bedroom: Lisa, it is up to you to continue or not, but if you quit now, when you’re at your lowest, you will always wonder what would’ve happened if you stayed in it, fought harder. This didn’t help me much. I had fought my hardest. What more could I do? Then she added: If you quit, you will not get out of school early to go to practice, you will have to take P.E. class, you will not have nice leotards or team sweats, you won’t travel, you won’t compete. You will not be a gymnast or do those special things. You will be normal like all the other kids at school. What? Normal? Like everyone else? This was ALARMING. I went to bed, had terrible nightmares, and woke up. In the morning, I was terrified. If I was not a gymnast anymore…then who would I be? What would I do? Who would I be? Well, I knew. 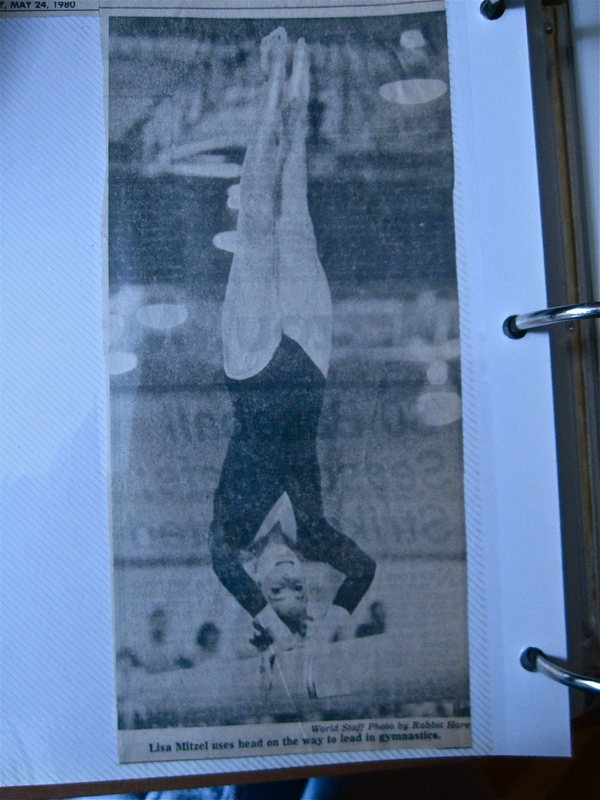 I was a gymnast. I loved it and I could not quit. I’m a California girl! Age 14 at the beach.